I think that I may have committed a fashion faux pas over the weekend: I repeated the octopus necklace for the second time in a week. How shocking. But I’ve started this week off fresh with this cluster of seaside detritus, from Target. There are so many layers of sealife in this one that you can’t even see all of them at once. See that fish tail hanging down beneath the crab? 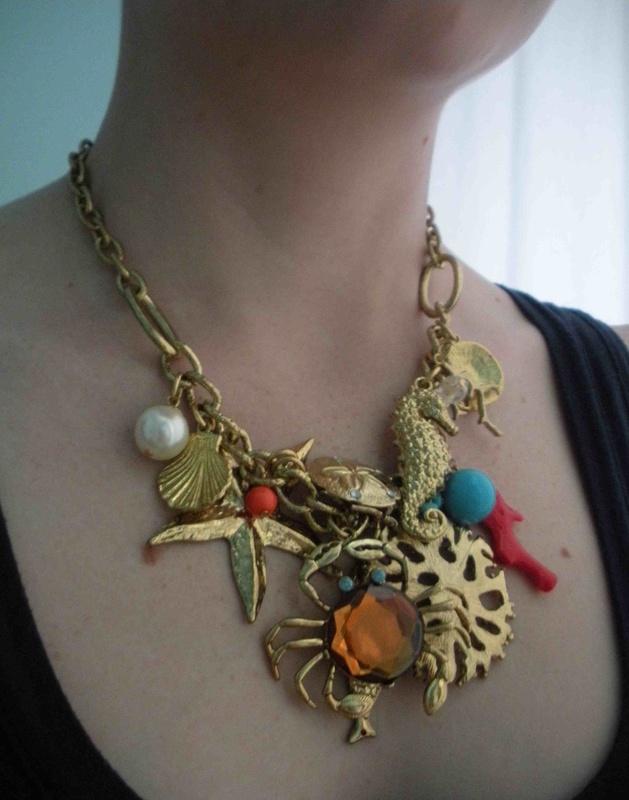 There’s so much sealife, in fact, that I’m probably going to have to take this thing off before I can get any work done—it’s a bit heavy. I’ve been spending my mornings lately with Rodney Yee. I had these yoga programs on VHS (!!!) but got out of the habit when lightning killed my VCR (a mercy, really). Then I bought the DVD—but, mysteriously, my laptop refuses to play it (although it plays everything else just fine). Despite this conspiracy, I’m finally getting into the habit (thanks to Erich’s Xbox, which seems happy to play the DVD). Admittedly, AM Yoga in my small (and cat-filled) living room can be a bit of a challenge. Yesterday, a foster kitten ran across my hand and scratched me deeply in the midst of “deep relaxation.” This morning, Mr. Cat started chewing on my glasses in the middle of a leg stretch and then stepped on the controller and hit fast-forward. It was later revealed that his food bowl was empty. I’m counting down to my trip to the UK later this summer. We’ve finally set the itinerary: four nights in a cottage outside Bath, two nights in a B&B in the Lake District, a week on the Royal Mile in Edinburgh, and four nights in a hotel near the Tower of London. On my must-see list for this trip: the dinosaurs in Crystal Palace Park. Tintern Abbey, Dove Cottage, the Brontë Parsonage, and some odd things in the London museums. The big question: how many sealife necklaces can I fit into my alarmingly small Timbuk2 suitcase? There are going to be four of us driving around in a small rental car, so suitcase space is at a premium. Does anyone have any packing advice? I, being quite the fan of organization, like to begin obsessing about packing far in advance. I already have some little packers and good walking shoes. . . I have had an alarmingly similar history with my own yoga tapes/dvds. Except for the lightning. And the cats. And mine are Bryan Kest tapes, which is somehow shameful.